A few weeks ago, Tyler from Mengel Miniatures sent me a pic of a Flesh Tearer he painted up using the same process I did (the models were for the same Flesh Tearer army). He mentioned using the same process to paint his models that I used to paint mine and I found it interesting to compare both his and mine as we used a similar process. I did a squad of Flesh Tearers on commission a little while ago and it was on a whim that I decided to use the GW scheme as they outlined it. I'd never really painted a "dark" red before, just the standard Blood Angels red scheme on some Space Hulk Terminators. GW had published the "official" way to paint Flesh Tearers if you will in an issue of White Dwarf. I've always enjoyed trying to copy their stuff and usually find something new for myself in the process. In this case, I altered the process slightly on my own model for speed and ease of painting. We all have our own quirks and ways we prefer to do things when it comes to painting. I love the darker red on these guys. More than I do the regular red you see on Blood Angels. Maybe it's my preference for the grim, dark side. 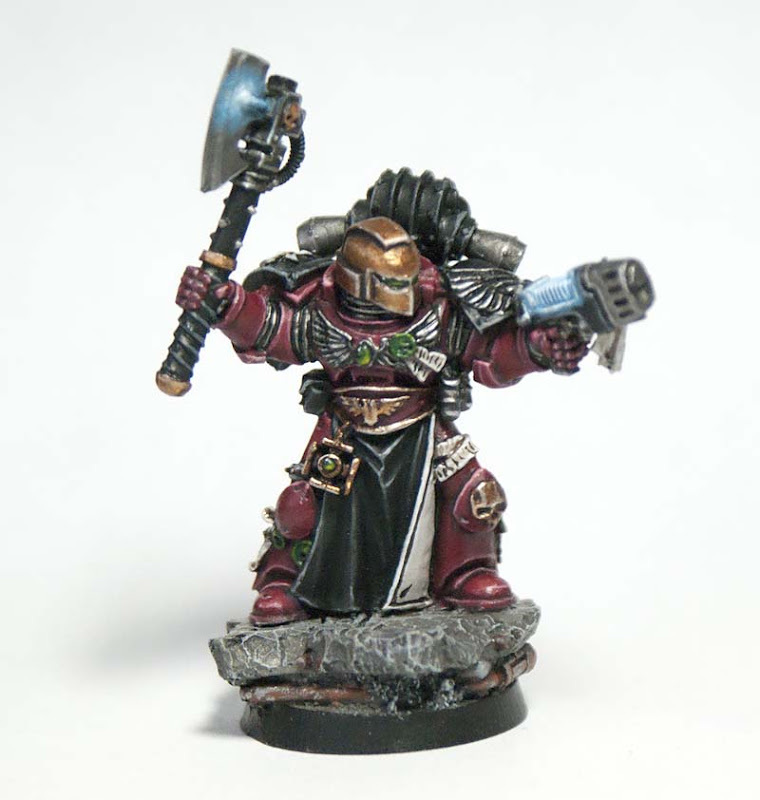 If I were to paint up a space marine chapter in red, I'd definitely find a way to make it this shade of red for sure. I'd like to thank Tyler for sharing his Flesh Tearer model. I think he did a great job matching the scheme. You can check out more of his work at Mengels Miniatures. Ian: The whole grim dark thin is a personal choice. I do enjoy seeing nicely painted, "brighter" models as well. I think as I go through the hobby, my tastes are evolving as it were and I enjoy different styles of painting more now than before. I think Tyler did a great job and I don't imagine you could tell the models apart on the table. Both models are really great. Always very inspiring to see such nice minis! And that Flesh Tearers article in WD was one of the more worthwile ones in my opinion. Have to admit, your tutorial actually has me a bit fired up to strip the old Fleshtearers army I have and actually paint it up in the new and improved format... Thanks for sharing! KrautScientist: It's Novamarines for me. I like the quartered scheme. I'll be posting pics of my test model on Monday actually. pchappel: It was fairly easy to paint from what I remember too. Nothing terribly difficult about it in the end. Marcin: I'm going to have to look at those. I picked up some P3 "dark" red paint a few weeks ago because I thought it looked cool, but I've yet to use it. I definitely prefer the darker schemes to those of the lighter standard. It just seems right to me in the context of the "grim-dark" future setting. That'll be interesting to see, Ron! The Novamarines colour scheme always looked a bit too gimmicky for my taste, so I'm very interested to see your take on them! @ Ron Saikowski: Black Red and Hull Red are probably the deepest reds in Vallejo range, together with only slightly lighter Burnt Cadmium Red, which is only a tone lighter than Black Red. People who paint WW II German armor prototypes love them, because they're similar to German red primer - and seeing original (as in stolen from German factory by advancing Soviets) metal sheets, I tend to agree with them. Of course, both colors are really dark, and they do resemble spilled and dried blood quite convincingly - I'm looking at the bottles right now, and Black Red reminds me of my past mishaps with scalpels and whatnot - but for really dark color schemes they should be perfect. @KrautScientist: Well I don't really hate helmetless Marines, I just don't care for them as much. I think of it from a tactical view, not wearing your helmet makes you an easy target. I completely understand the character side of the no helmet idea, its just not my cup of tea. Something about a Space Marine wearing that iconic expressionless helmet with glowing red eyes is just awesome to me. Very dark and sinister to the protectors of humanity. To each their own I suppose. Kevin: See now I like the occasional non-helmeted marine. I think it adds to the variety and look of the unit. I definitely agree that a nicely painted and battle worn helmet with the glowing eyes is very sinister indeed and has loads of character on it's own. Tyler: Thanks for sharing the pics! dancing platypuss: I'd say more in line with how I imagine the 40k universe before I said more real. There are guys out there painting very lifelike that are lightyears above me in terms of skill. Marcin: I think that's part of the fun in painting... finding those colors you enjoy using and figuring out how to work them into your force. 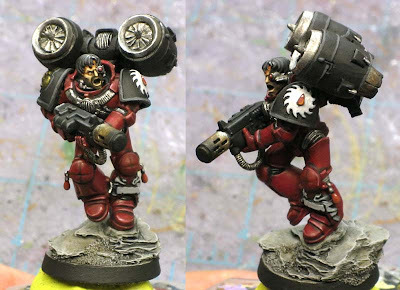 Marines have 'no' fear, now I like the dark paint job but the bright red, I play Blood Angels, says forget you! ...And they shall have no fear etc. As far as yellow, yes I agree, darker is better because the old yellows were too thin, I do not know of the newer paints. Lastly, I will admit it gets old to paint red day in and out. The only way to jazz it up is with the Death Company Black red, white, blue then commanders having gold, silver, etc. That's why I'm looking at Imperial Guard, bit more of a challenge and more to put on the tanks. SM are too neat, not like Chaos or Orks which I have played and modeled with both. BHTechMech: I agree. By being able to add those other colors to your army, you can break up the monotony of painting one color over and over.